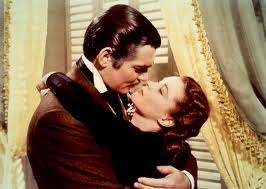 There's no getting away from Gone with the Wind, either as a darling of the Academy or as one of the most commercially successful films of all time. Nor is there any escaping its influence on filmmaking, from its direct impact on the golden age of Hollywood, through to less desirable legacies in the shape of Out of Africa and Heaven's Gate. With a reputation exceeding that of almost any other film, it is something that everyone should see once - but probably only once. Apart from anything else, you have to admire the sheer ambition of Gone with the Wind from a production point of view. The scale of filming is immense, taking in huge barren plains, long warm sunsets, sprawling towns and every kind of weather other than snow. At a budget of $3.9m in 1939, it was already the third most expensive film ever made, behind only Hell's Angels and the 1925 version of Ben-Hur. There is nothing about the production which feels cheap or half-hearted, with impeccable craftsmanship in every set and shot. This is more remarkable when you consider the film's complex and convoluted production history. David O. Selznick purchased the rights to Margaret Mitchell's Pulitzer Prize-winning novel for a record $50,000 in 1936. What followed was two years of bartering and in-fighting where Selznick and the executives at MGM and Warner Bros. grappled over matters of budgeting and distribution rights. 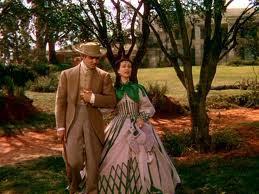 Gone with the Wind took nearly two years to cast, with Vivian Leigh only being installed as Scarlett a week before shooting started. Filming began in January 1939 and last for five months, during which time Selznick fired both the cinematographer Lee Garmes and original director George Cukor. His replacement, The Wizard of Oz director Victor Fleming, expressed dissatisfaction with the script, so Selznick and screenwriter Ben Hecht re-wrote the entire film in five days. In May, Fleming briefly left the production due to exhaustion, with Sam Wood being drafted in to cover. This version of events would seem to paint the production as one of ego gone mad - Selznick's, namely - and would set the film up to be a total catastrophe. But it's worth remembering just how radical aspects of Gone with the Wind were when it was first released, and how it courted controversy with the censors. This was the age of the MPAA's Production Code, in which there were clear lines between what could and could not be said or shown in a film. 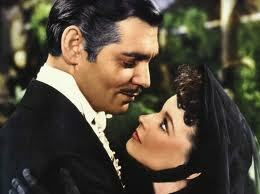 Clarke Gable's famous final line, "Frankly, my dear, I don't give a damn" sent shockwaves through the Code's administrators, and Selznick only avoided a hefty fine by an amendment passed by the MPAA board, which permitted the use of "damn" or "hell" within an appropriate historical context. For a film that went through three directors, two cinematographers and one of the most hands-on producers in the history of Hollywood, it is remarkable that Gone with the Wind still looks and feels like a single film. The visuals in places are exceptionally beautiful, particularly the bright pink sunsets and the composition of the battle scenes. 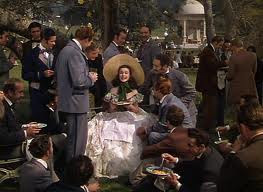 One of the best sequences comes during the Civil War part of the story, which finds Vivien Leigh wandering through acres of injured men, lying and dying all around her. 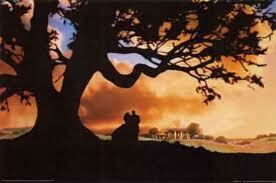 In terms of its themes, Gone with the Wind explores the concepts of chivalry and honour. It is nostalgic about the age of chivalry, in which masters and their companions went through life side by side, doing what is honourable and helpful to others even at the cost of one's own life or happiness. 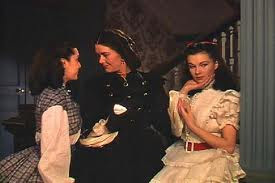 Scarlett's multiple unhappy marriages reflect this theme, as she repeatedly makes herself unhappy out of silent respect for the marriage between Ashley and Melanie. In turn Melanie thanks Scarlett for her loyalty, delivering the film's central lines as she lies dying: "Look after Ashley, Scarlett... but... don't ever let him know." Much of this review so far has focussed on the reputation of Gone with the Wind. The positive comments made therein would seem to confirm its status as the greatest American movie of all time. Sadly, this is not the case. For when stripped of its acclaim and its trophy cabinet full of Oscars, Gone with the Wind is riddled with myriad flaws which, while not totally scuppering it, severely tarnish its image. The first, and most obvious flaw, is that the film is way, way, WAY too long. Even if we take out the intermission and the title cards, it still overstays its welcome by at least an hour, insofar as the story could have been handled in a shorter time through a simple act of compression. There is an argument that today's audience are more impatient, and would not watch a four-hour film no matter how good it was - an argument supported by the initial screenings, in which the punters begged MGM not to cut a single frame. But there are whole sections of Gone with the Wind which are so baggy and repetitive that even devotes of The Deer Hunter would struggle to resist looking at their watches. The first hour in particular is very difficult to get into, being populated by a huge number of characters who are all in some way unlikeable. 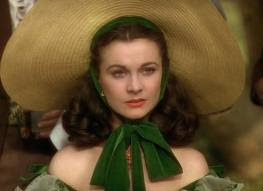 The barbecue at Twelve Oaks consists essentially of spoilt rich people bitching about each other, with Vivien Leigh coming across as a childish brat who moans and screams and cries whenever she doesn't get her way. Leigh is a good actress who is undeniably beautiful, and very good at demonstrating the ambivalence of the character in her attitude to others. But we end up as ambivalent to her as she does to Ashley, and it take a lot of patience to stay with her character. Because the film is attempting to be so big in every single department, it ends up as the dictionary definition of sprawling. Although it just about manages to keep us focussed on the central characters (anchored by the great performance of Clarke Gable), the supporting cast is way too big, with potentially enthralling individuals endlessly drifting in and out. When characters do come back, they re-appear in the most contrived way imaginable; Sam, for instance, just happened to be sitting around the campfire when Scarlett was being attacked on the bridge. This brings us on the racial aspect of the film. The arguments here are the same as those surrounding The Birth of a Nation: do we accept the racial attitudes as a product of an historical period, or do we criticise such a revered film for being so deeply questionable? 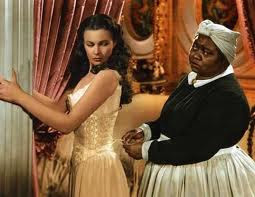 If we take the latter view, then the film is totally reprehensible, with almost every black character being reduced to pantomime; they never question their duty and seem incapable of functioning without being ordered around by impeccably dressed white nobles. If we accept the former, then the film is slightly more enjoyable, but the characterisation of Prissy as a screaming, incapable slave girl is still nothing short of toe-curling. In the last half hour, the film's poor storytelling is exposed and things get completely silly. 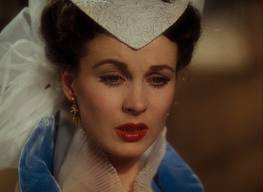 In further testimony to it rambling, aimless style, most of the main characters are quickly killed off so that we arrive, very clumsily, at the union of Scarlett and Rhett. 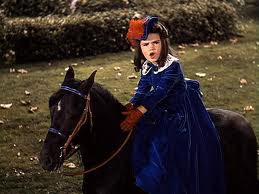 Every plot point in this section is prompted by an unfortunate death - Bonny falls from her horse like Scarlett's father, and Melanie falls mysteriously ill again, just so Scarlett can realise that Ashley never loved her. The plot drags laughably as we yearn to get to the staircase and Rhett's final line (which, of course, is not the end of the film). 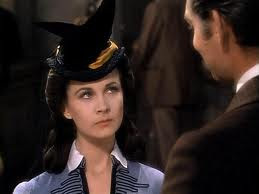 Gone with the Wind remains that most difficult of films: something which is so heavily flawed and hugely overrated, but also essential viewing for anyone who loves cinema. It is better than subsequent epic romances like Out of Africa because even at its weakest, baggiest moments it still feels like it is going somewhere. But its greatness is ultimately tarnished by its dated attitudes, poor storytelling and ramshackle structure. In short, it contains both the best and the worst that Hollywood has ever offered; it's massively, massively flawed, but also strangely irresistible.